Our Resort on Hollywood Beach has been named one of the 25 Best Romantic Beach Vacations in Florida! 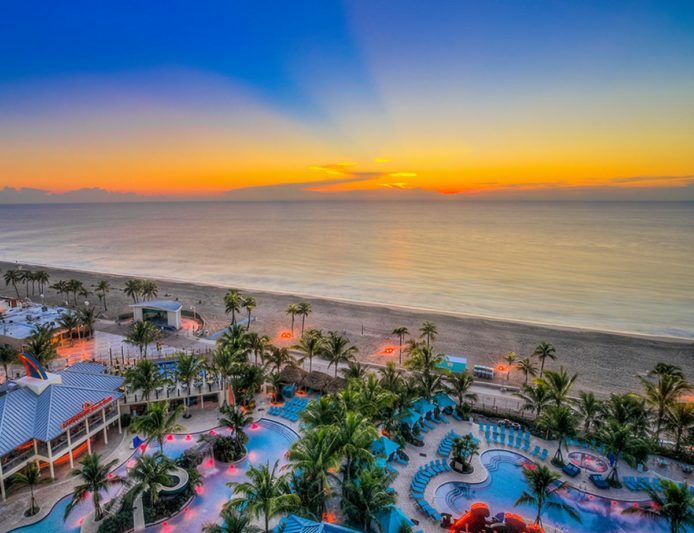 Located on the legendary Hollywood Beach Broadwalk, Margaritaville Hollywood Beach Resort is a luxurious resort and entertainment complex inspired by the lyrics and lifestyle of singer, songwriter and author Jimmy Buffett. The resort features a blend of luxurious suites and comfortable rooms decorated in cool coastal colors boasting en-suite bathrooms with rain showers and soaking tubs. Private furnished balconies feature breathtaking ocean views. By day, enjoy a range of fun beach-based activities such as body surfing, paddle boarding, and surfing on the FlowRider. By night, choose from one of eight casual and upscale dining and entertainment venues at the resort, from great steak and wine at JWB Prime Steak and Seafood to signature cocktails at the LandShark Bar & Grill, or the 5 o’ Clock Somewhere Bar & Grill.